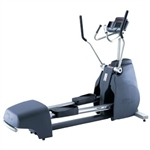 The Star Trac E-CT Cross Trainer truly is the total package. With a sturdy frame and 20 levels of resistance to choose from, this elliptical will keep both novices and seasoned pros pushed and challenged. Lighter than some of the other machines in Star Trac’s line, the Star Trac E-CT Cross Trainer is 365lb, meaning it’s also smaller. The efficient footprint of its more compact size means freed up space in your home for other things.